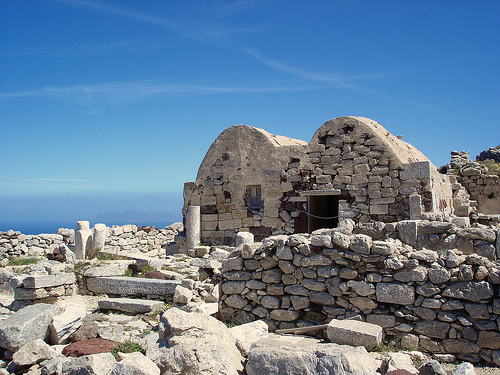 The Early Christian church of St. Stephen of Santorini is located on the mountain called "Mesa Vouno", at the entrance of the Ancient Thira ... The temple was built on the ruins of an early Christian church dedicated to St. Archangel Michael. It should be noted that, what we now call "Mesa Vouno", was formerly called "Mountain of St. Stephen" due to the existence of the church. "Mesa Vouno" was called the "neck" that is connecting the mountain with the Mountain of Prophet Elias. This "neck" is now called "Sellada", as was the name in the ancient times... Sellada accommodated the necropolis (i.e. cemetery) of Ancient Thera.